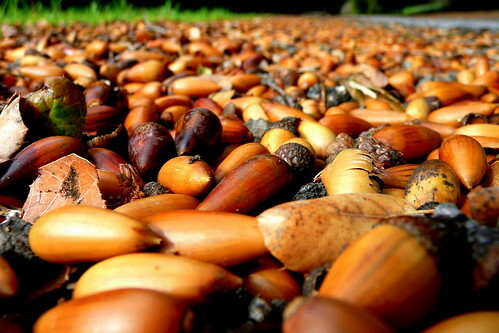 Everywhere I walked, acorns; millions and myriads underfoot, crunching, crunched, not so sharp; not so soft they wouldn’t be noticed. Too early, I thought, for squirrels to be thinking winter, they spread out on sidewalks, dotting streets perceptibly, causing us to look up, to notice where are the oaks, interspersed with the last of the elms climbing so high to the sky and creating cityscapes of dwarfing dimensionality. I entered the too-dark park, not able to see ahead or even much around, the clicking-crunch of acorns told me where big tree trunks surrounded the path of directness. Up the hill, a meadow of few trees, still small, no crunch on grass still soft from last week’s rains. On top, now, among more acorns, a haze-oranged full moon just risen, drew my look, deeply into its being. Overwhelming! Standing, descending among more oak trees, dropping acorns everywhere, the crunches matched the crickets’ callings.